This post deals with detecting problems in your ETM (Electronic Throttle Module) manufactured by Magneti Marelli (Fiat) for Volvo between 1999 and 2001. 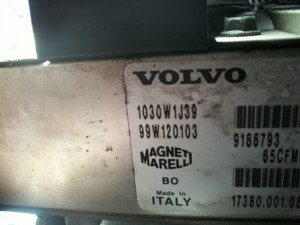 All Volvo dealers we contacted were aware of the problem. They all said it could be fixed for around $1,000 after a mandatory two-hour inspection at the dealership at a cost of $89 per hour (Volvo of Chattanooga), $99 per hour (Clayton Volvo of Knoxville) or $105 per hour (Dyer & Dyer Volvo of Chamblee, GA). Apparently, you can get the ETM for your Volvo from any online auto-part store located in Europe even cheaper, but you will need Volvo to load the software on it, which they most probably will not do for you. At least, not for free, judging from their prices above. A very, very special “Thank You!” goes also to Rob from VolvoTips.com, who helped us with our engine’s condition remotely.